Under a sun-bleached sky that is no longer blue, dry coughing barks from black-backed jackals lope in from our left . . . Wraack, wraack, wraack. . . Black-backs are scavengers, more aggressive than other types of jackals, occupying the same ecological niche in Africa as coyotes do in North America. Unlike coyotes, black-backed jackals do not howl. They often steal meat within the reach of a lion’s paw – although their main diet consists of insects, lizards, snakes, rodents, birds and ripe fruit. Up ahead Morula slaps her ears flatly against her shoulders. Elephant air-conditioning for a creature that produces enough heat to warm a small house. Elephants are pachy-dermed, “thick-skinned.” Some of Morula’s blood vessels are buried as deep as one-and-a-half inches under the surface of her skin. Since she doesn’t have sweat glands, her ears act like giant heat exchangers, regulating her body temperature. As her ears open, her body size increases by roughly twenty square feet, a huge area for thermoregulation. Air moving over the swollen arteries of each ear cools her blood as much as nine degrees before it returns to her body. I take a photograph of her ear in mid-flap. Where Morula’s ear attaches to her shoulder, wrinkles give way to he swollen vessels pumping five gallons of blood per minute across the surface of her ears. 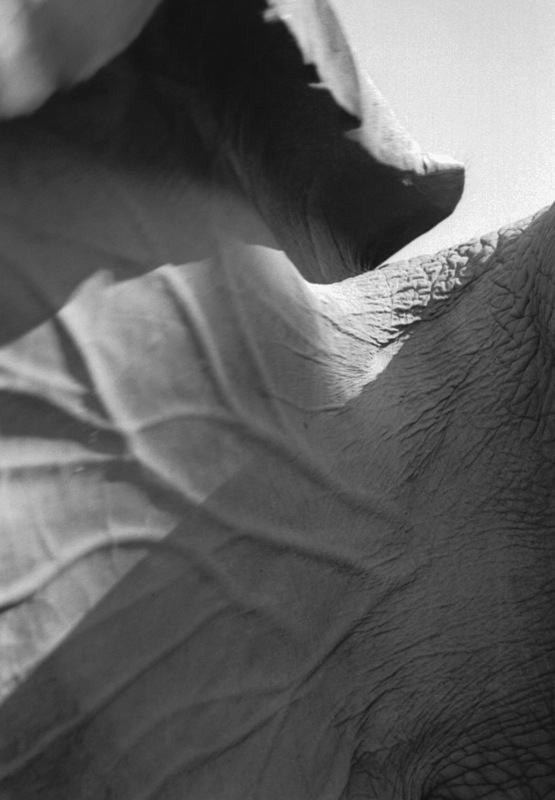 The pattern of those arteries is as unique as a fingerprint, and often used for identifying individual elephants.